The time window can be configured between 0 and 300 seconds. 0 seconds means no downsampling. Downsampling reduces the outgoing traffic several times. 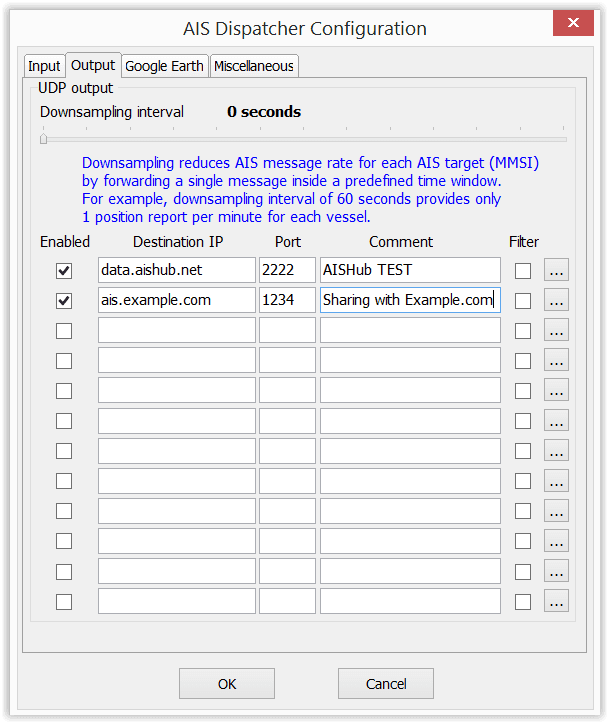 Downsampling affects AIS messages 1,2,3,4,5,18,19,24 only! The following example illustrates how AIS Dispatcher can forward NMEA messages from a single AIS receiver to AISHub.Net, other destination and local ShipPlotter running on the same machine. We receive a lot of questions by software developers who need some raw AIS data to test their applications. Here you can download a sample with raw AIS data from AISHub. The file contains ~85K messages (3 minute live AISHub feed). Download AISDispatcher ZIP file and unzip it in a separate folder. After the first start, the program runs with default configuration. You can place a shortcut to aisDispatcher.exe on your desktop or into the "Startup" folder for an automatic startup. The configuration dialog is displayed by pressing “Configuration” button on the main window. 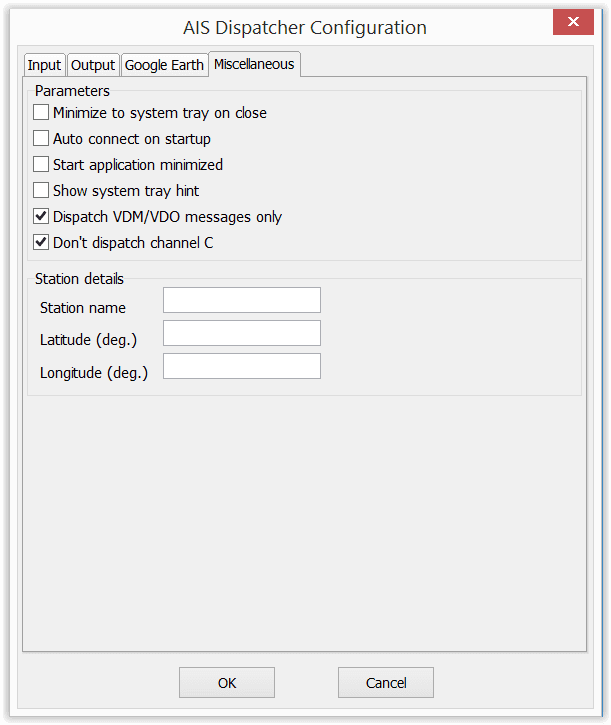 The “Configuration” dialog contains four configuration panels – "Input", "Output", "Google Earth"and "Miscellaneous". Baud rate – baud rate selection (example: 38400). Serial input uses 8,N,1 serial settings, according to NMEA specification. Destinations up to 12 destination IP addresses/ports. 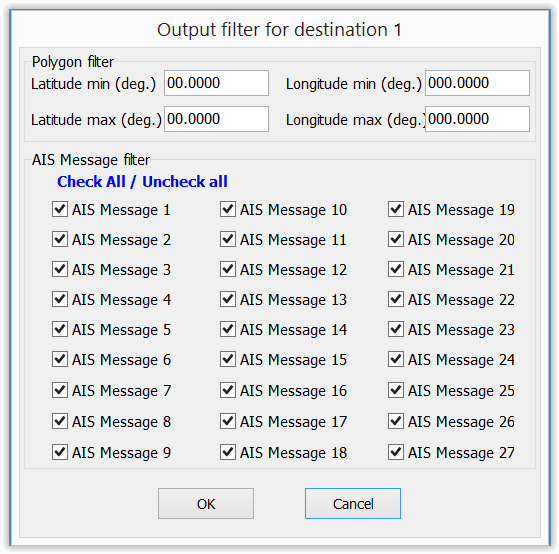 AISDispatcher forwards AIS data to all configured and enabled destinations. In our example, there are two destinations. Expriation time – AIS Dispatcher keeps list of all received vessels since the startup. Each minute, the application purges the list and removes the vessels with last packet timestamp older than the defined “expiration time”. 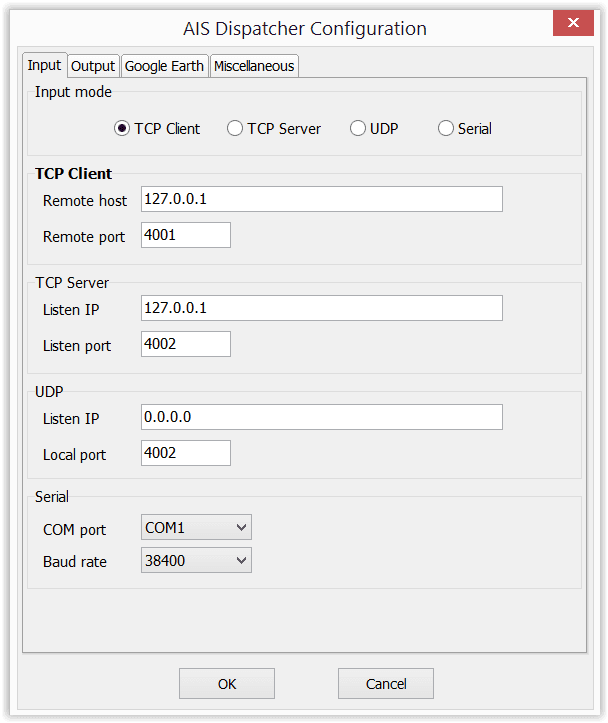 Host / Port – AIS Dispatcher listens for network connections from Google Earth clients on the specified host / port. When host is “0.0.0.0″ (by default), the application listens on all network interfaces. Allow localhost only - disables connection to all external interfaces. AIS Dispatcher listens for connections only from Google Earth clients started on the user’s PC. Enable – enable/disable the regular export of KML/KMZ file into the local hard drive. AISDispatcher saves the file in its installation directory, “kml_export” folder. The file is named “aisDispatcherSnapshot.kml” or “aisDispatcherSnapshot.kmz”. Use ZIP compression - when ZIP compression is enabled, AISDispatcher generates KMZ instead of KML file format. In this case, the application consumes more CPU time, but reduces the network traffic several times. KMZ format also consumes more CPU time by the Google Earth client. Show vessel names - displays all vessels names. Minimize to system tray on close when pressing ALt+F4 or “X” button, the application is minimized to the system tray. It can be closed by clicking on the system tray with the right mouse button and selecting “Exit”. Dispatch VDM/VDO messages only filters only VDM/VDO messages from AIS sources. If the filter is off, the AISDispatcher will forward all other NMEA messages (like GPS devices for example). AIS Dispatcher’s main window contains connection controls and detailed statistics of the input data feed. Message counters and byte counters of the incoming data feed. For more information about the meaning of the fields, check the AIS specification. There are 24 different types of AIS messages. This panel displays separate message counter for each message type. Additional details about each message type are displayed by hovering with the mouse over the counter. In/Out ratio - ratio between input and output data counters. This parameter shows the efficiency of the downsampling algorithm. Distinct vessels – current number of vessels kept in AIS Dispatcher memory buffer. 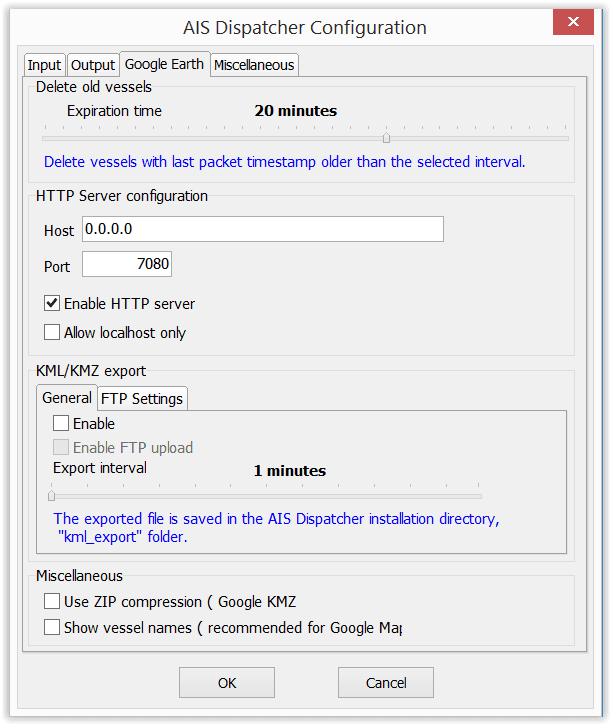 AIS Dispatcher supports the native KML / KMZ format of Google Earth and listens for incomming connections from Google Earth clients. The configuration of HTTP server parameters is described in AIS Dispatcher – Windows section. The easiest way to view the AIS Dispatcher data via Google Earth is to open the file “AISDispatcher.kml” in the application folder. The file automatically redirects Google Earth to http://127.0.0.1:7080 and sets the refresh interval to 60 seconds. The connection can be established without AISDispatcher.kml file by selecting “Add” / “Network link” menu in Google Earth application and entering the name of the connection and the URL (for example http://www.example.com:7080). The refresh interval has to be configured from the “Refresh” panel in the same dialog window.